With recent talk of hardware and OSes, let's not forget about the software side of things. Here's a round up of new and updated software. As revealed earlier on drobe.co.uk, Chris Wragg has developed some new software, Bookings, for bed'n'breakfast or small hotel owners. Written after a request was posted to Usenet, Chris' software "displays bookings made on a see-at-a-glance grid, and records details of guests and their bookings". We last mentioned Graham Shaw's RISC OS Toolkit in September last year, and we've been reminded to look at it again. Graham's "class library for developing RISC OS application programs in C++" is up to version 0.5.0 and is different from other libraries, in that it allows an application to have a dynamic layout. Heralded as "the most powerful new feature added to ArtWorks since the introduction of transparency in spring 2002", MW Software has added dynamic clipping (as well as other features) to Artworks 2.2 in time for the Wakefield 2004 show. 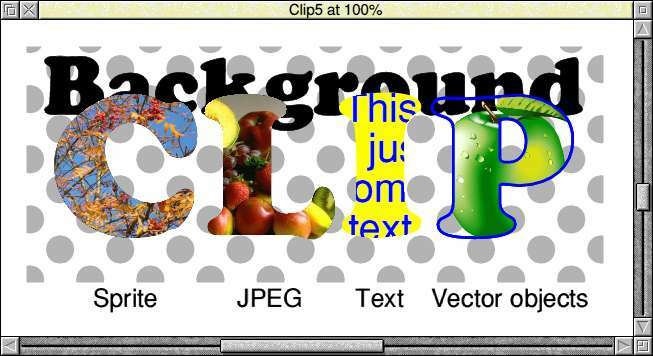 The dynamic clipping allows objects to 'clip' other images and objects, as shown in this example. The Artworks rendering module will also be updated and a new version released so that third party applications can render Artworks files that include dynamically clipped objects. And speaking of MW Software, GView 1.41 is now out with support for displaying EPS files. Application launcher NeXTBar has been updated to version 1.13 - although author Paul Vigay's site is 404'ing at the moment. The Feds have denied all knowledge, however. ResourceFS tool RSFiles and BASIC shared library manager Basil are now 32bit compatible. And finally, a new version of PDF is available, bringing it in line with xpdf 3.0. ClipView is really amazing (being a beta tester I had a chance to play with it a bit) - and I can clip everything like bitmaps (aka Bitmap fill! ), simple objects, grouped objects, clipped objects, ... And the dynamic bit means that the objects clipped as well as the clipping path are fully editable. To top this he managed to update AWRender accordingly so that you can use images with ClipView objects in other apps like Impression, Ovation Pro and the like ... and soon in TechWriter AFAIK. And Martin (as is usual for him) made it in time as he announced he would. It seems to me that Artworks can now do everything most people could ever think of, and if anyone wants to do something nobody has thought of, Martin is within months happy to implement it! What fantastic progress has been made since Martin took over the source code. BRAVO! People seem to forget just how insanely great Artworks was compared to Illustrator back in the early ninties - freehold tool worth using, brilliant anti-aliasing, incredible speeds. More than that, though it has a 'feel' that's never been bettered. I'm still on 1.7, but I still use that to get orginal compositions going before moving to Illustrator 10. Maybe it's just nostalgic goofing around, but it's probably the feel. The way Martin is going, he'll be making ArtWorks comparable to IllustratorCS soon. I'll keep my eye on this. Would love to be able to switch back one day. I nominate Martin W�rthner for the Gerph award for services rendered to RISC OS. And don't forget CC, whose design of Artworks as a massively modular system made it possible in the first place. Someone should write an alternative history book where Impulse became the default OS for Archimedes. Tried to access www.mw-software.com and accidentally entered www.mw - which although Drobe isn't highlighting it as such, is a complete functioning URL!